This is a work in progress shot of my “mini” quilt (about 24×18) for our Guild’s mini quilt auction in March benefitting the Children’s Craniofacial Foundation. I have a book that shows sort of modern patterns for free motion quilting, and I used the basic swirl pattern along with a lot of echoing the patterns. The first hour or two were not good (and I had tried about 3 sample blocks first), with much experimenting with needle, thread, tension, settings, etc. ) I had lots of problems with thread breaking. I visited a quilt shop on Sunday to pick up my large row quilt from my new best friend Maria Hall (who did an A++ job quilting it), and one of the quilt shop people recommended the sharper micropoint needle and the aurifil thread. (I had tried both machine quilting and regular dual duty threads, and they kept shreadding in the needle). That helped a lot, and yesterday I read a FMQ blog that suggested changing the stitch link to zero, so that worked too). this does become addictive once you get going and get the bugs worked out. I haven’t done the binding yet, which will probably be one of the aqua fabrics in the bird. It is draped on my sofa to catch the morning sun, so not perfectly flat. You did great for a first timer – a lovely piece. 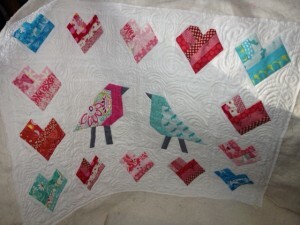 Congrats on finishing your machine quilting! It looks great, and you definitely should be proud.